1 How to erase things without problems? How often did you inadvertently send white and colored things to the laundry at the same time, as a result they lost their color and attractive appearance? At such moments it begins to seem like the only way out is to throw away the damaged clothes. Almost all hostesses due to inexperience faced such an unpleasant situation, therefore the question of how to wash the faded white linen It is particularly acute. Is it possible to wash a faded thing if everything is very bad? Fortunately, there are a lot of ways to wash away faded colored things, and thanks to this guide you will learn about the best, most effective and proven methods among the people. Get ready to remember useful tips for you. How to erase things without problems? Before washing clothes always read the information on the labels. There you will find all the necessary information about what to set the washing mode, what you can do and what is prohibited. Already this data will be quite enough to wash your clothes without incident. Always wash white items separately from color and dark clothes - this will definitely help. Cheap synthetics are subjected to molting most of all, so try to wash them separately from others. The least molt products made from natural materials. Recently purchased items should be washed separately from those that you have for a long time. These tips will help you, but what if it's too late? How to wash faded things and return them to the old look? Do not rush to panic - below you will learn about the best ways to wash faded things at home without extra time and money. Soak clothes in a warm solution of soap in water. It is enough to hold the item in the solution for 60-90 minutes, then check the result. If the stains still hold, mix a little shavings of soap, a glass of salt, citric acid and a spoonful of starch, then apply the mixture to the stains from the wrong side. When the 12 hours pass from the moment of application, rinse the clothes and wash them in the washing machine. How to wash faded clothes without much hassle and very quickly? There is an old way that was popular with our grandmothers. Dilute with a little water a little liquid ammonia, warm the mixture and soak in it faded clothes. The only drawback of this method is that the clothes will emanate a strong smell of ammonia. How to wash off faded fabric with the smell of ammonia? Run it several times in the washing machine. Hydrogen peroxide is another excellent way to wash faded things when washing, especially if they are white. Dissolve a teaspoon of peroxide and a small amount of soda in one liter of water, then pour the faded product with the prepared solution and heat it to a temperature of 60 degrees. To increase processing efficiency, stir the clothes evenly for 10-15 minutes. After this treatment, things must be rinsed well in cold water and sent to a washing machine in the usual mode. How to wash off faded spots, if there is potassium permanganate at hand? This is an excellent tool with which you can handle even the most serious cases. You need a full bucket of hot water, in which you need to add a little laundry detergent and potassium permanganate. The prepared solution is used for soaking faded clothes. After you put the clothes in a container, close it with plastic and leave it for a few hours. When time passes, thoroughly rinse things and send to the washing machine as usual. Here are all the effective means of how to wash a faded t-shirt or other thing in white. If any method does not give the desired result immediately, do not hurry upset - try again. Do not forget that many solutions for washing faded clothes can be enhanced by adding a small amount of coarse salt or baking soda. Also, you will be interested in tips on how to clean the otlinyavshuyu thing with the help of special tools that you can buy in the store. Universal bleaching products. Sold in stores of household chemicals and help remove stains resulting from the shedding of clothing. How to wash otlinyavshie things? Strictly follow the instructions given on the tool - this is enough to get the result. Bleach How to wash a faded thing, if the choice is in front of various types of bleach? If possible, use oxygen-containing agents, as they carefully affect the clothes and do not spoil their appearance. Chlorine bleach on the contrary, can cause a noticeable yellowing of the treated items, which is even worse than before. Color reducers. 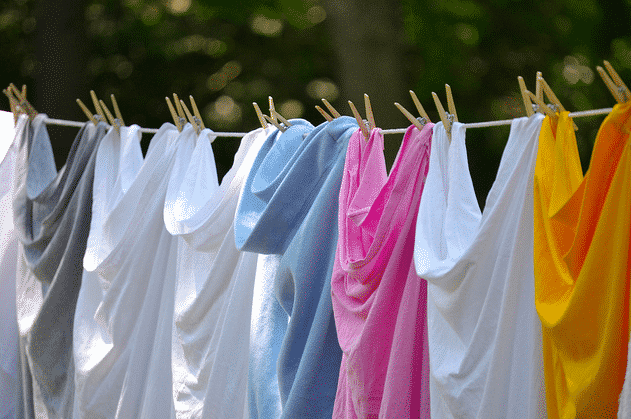 How to wash away faded colored underwear quickly and efficiently? You can buy a good color restorer in the household chemical store. As a rule, such tools can be used for hand washing clothes, and for automatic in the machine. Before you wash the faded thing with a special tool, be sure of its quality. No need to save, because the means of poor quality can only exacerbate the problem with faded clothes. Faded jeans can be dyed with special dyes. In the same way, you can deal with any durable and dense fabric that has lost its color. Unfortunately, it is not always possible to return the old look with this approach, but it is possible to prolong the life of things. How to wash a white T-shirt, if it faded, but there are no special tools at hand? Simply wash it several times in cold water with the addition of a large amount of powder. What to wash out if a thing faded? Pour a full bucket of water, add some good bleach, soak the clothes and cover the container. After a few hours of soaking, remove the items, rinse thoroughly in cold water, and then send to the wash.
What to wash if things are shed, and you do not want to prepare solutions or spend money on special tools? Try to wash the faded clothes again in the same mode and temperature (before that make sure that they match those indicated on the label). Often this becomes enough to get rid of stains on the surface of clothes. Do not forget to abide by the earlier rules for proper washing of clothes, and then you will never have a question about how to wash away a faded T-shirt or any other thing - troubles with your clothes will not happen. Laundry soap is not replaceable in everyday life. It destroys all microbes, reduces the difficult to remove stain. It is said that during the liquidation of the disasters of the Chernobolsk NPP, people washed themselves to them. Manganese is scary, especially if the thing is dear and beloved. I, at one time had a white swimsuit. After visiting the beach, picnics, he was not that lazy, but there was no trace of whiteness. I boiled it in soapy water.